With the NFL roster deadline looming at 3 p.m. central time on Saturday, the Chicago Bears are slowly cutting loose 23 players, and Grizzly Detail will keep you up to date on which players are hitting the bricks, and which will be hitting opposing players in Week 1 of the regular season. Lynch, who was a Heisman Trophy finalist as a quarterback for Northern Illinois, could still be a member of the Bears if the team elects to use one of their 10 practice squad slots on him, but he has to first clear waivers. If another team claims him, he'll be placed on their 53-man roster. #Bears have informed TE Jeron Mastrud he will be released. 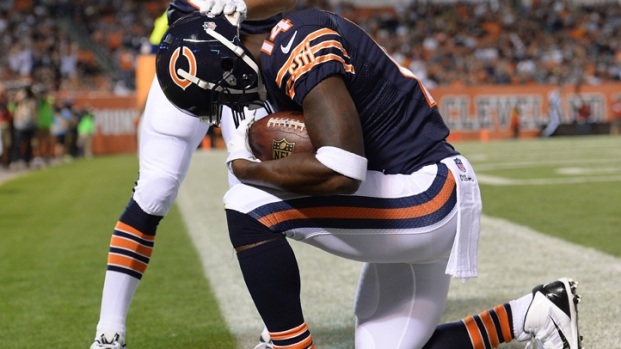 The Bears also made the decision to release wide receiver Armanti Edwards, further signaling that they are looking at keeping Santonio Holmes on the roster after his solid performance on Thursday night. There it is, Bears cut a former college QB great struggling to make it at another position in the NFL... Armanti Edwards. We'll continue to update the roster as cuts roll in.